Several studies and reports confirm that Asian biomass co-firing grows . China, Japan and South Korea are the main consumers while new opportunities and investments are increasingly flowing in the region. As recently analyzed in the USDA report (2012), Japan is the largest importer of wood pellets in Asia and that most of the pellets it consumes are used for co-firing at power plants. South Korean wood pellet imports are fairly small; however, South Korea is striving to increase its percentage of renewable energy, which could benefit the wood pellets industry. The report also found that China, the largest energy consumer in Asia, has an established wood pellet market. However, a majority of these wood pellets are manufactured in China, thus imports are minimal. A consistent factor in these nations is that their governments are promoting renewable energy, leading to policies that are driving demand for wood pellets. As these countries strive to meet their renewable energy targets, their wood pellet consumption is projected to grow. 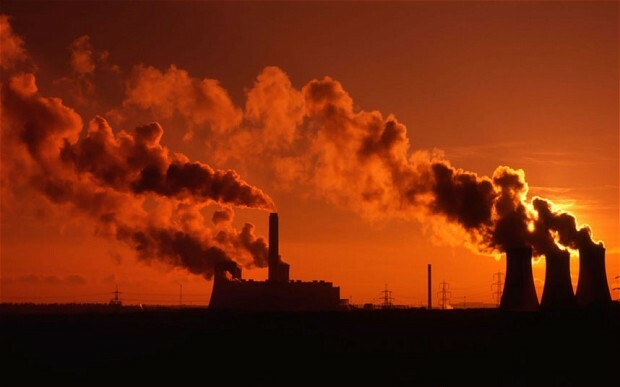 The major market objectives in the aforementioned nations will be for reducing carbon emission through cofiring. When discussing reductions in fossil fuel usage through co-firing, conversion benefits are often reported in terms of the amount of coal replaced, or the amount of wood pellets required as a substitute for 1 ton of coal. In reality, wood pellet/coal replacement rates are dependent upon coal properties. The coal imported into Japan and South Korea is classified as lignite, the heat content of which is not vastly different than wood pellets, whereas it appears that the coal mined in China is of higher energy content and greater volumes of wood pellets will be required for replacement. China does not have an extensive forest resource. The natural forest is poorly distributed over the country, and supports stands are of marginal quality. Since the mid-1960s, an area in excess of 115 million acres (an area equivalent to 20 percent of total commercial forestland in the U.S.) has been planted to softwood and hardwood plantations. While the effort is impressive, little attention was paid to wood quality of the planted material, which will not meet the quality standards for many solid wood products. It will, however, provide some fiber for pulp and paper and energy use. Mills procuring biomass for production of pellets purchase raw material by weight or cubic content. The table also provides a basic understanding of the magnitude of the difference between the nation with the greatest level of energy consumption, and two other nations. Replacement of 10 percent of the coal in China by cofiring would approximately require a staggering 500 million tons of wood pellets annually. 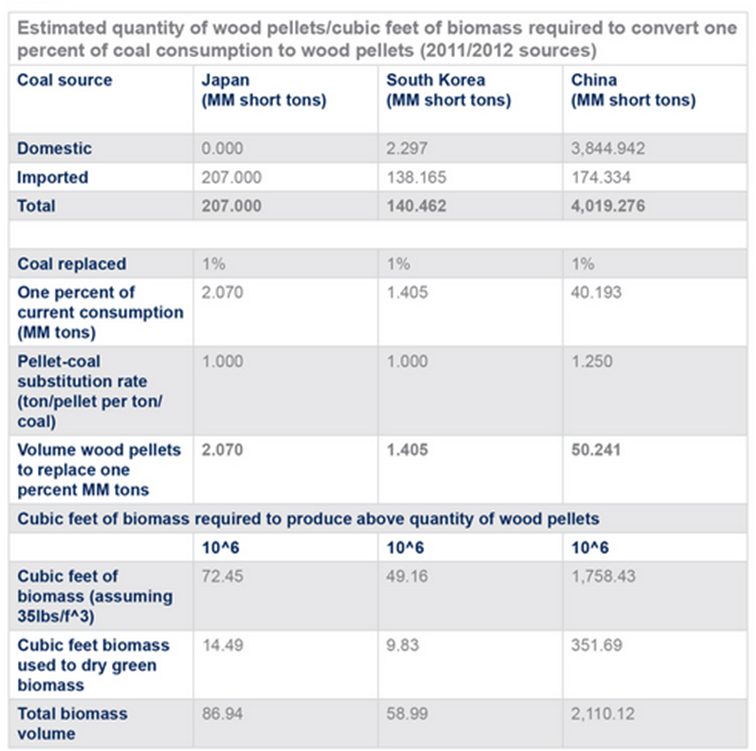 In 2011, the Alaska Wood Utilization and Marketing Center and the Center for International Trade in Forest Products conducted a project to review recent regulations and policies in South Korea, Japan, and China that could potentially increase the use of renewable wood energy products, specifically wood pellets. Given the lack forest resources, the solid forest products industry is dependent upon imports of both hardwood and softwood logs. Hardwoods logs are purchased from throughout the world, with major amounts coming from tropical sources. Softwood logs are imported from Pacific Rim nations and Russian Siberia. Japan has almost no natural resources, so it imports almost all of its coal, oil, and natural gas supplies. The top three sources of Japan’s energy consumption are oil at 49 percent, coal at 20 percent, and natural gas at 14 percent. The wood pellet industry is firmly established in Japan and is used for home heating as well as for power generation. In 2003, Japan produced an estimated 2400 metric tons of wood pellets, which increased to 60000 metric tons by 2008. The Japan Wood Pellet Association reports that there are 55 wood pellet manufacturing facilities in Japan (Japan Wood Pellet Association 2010). A large portion of Japan’s wood pellets are being used for electric power generation. Kansai Electric Power Corporation, a leader in this field, started using wood pellets for co-firing with coal at its Maizuru power plant in August 2008. The wood pellets will furnish approximately 120 million kilowatt hours of electricity per year, which is about 2 percent of the Maizuru plant’s total output (Canada Trade Commission 2008). Another company investing heavily in wood pellets is Mitsubishi Corporation, which has acquired 45 percent of Vis Nova Trading GmbH. This German company is a global leader in Europe’s wood pellet industry (Guizot 2010). The South Korean Government has laid out a vision of “low carbon, green growth,” which aims for sustainable economic growth by minimizing energy and resource consumption while simultaneously minimizing CO2 emissions. South Korean biomass demand is forecast to reach 10mn t/yr by 2020, following the introduction of renewable portfolio standards (RPS) for power producers. In order to promote this vision, the government settled on a basic plan of developing and popularizing the use of domestic new and renewable energy technology. This has been backed by the fact that South Korea is dependent on imports for 97% of the energy it consumes. The “new and renewable energy” classification refers to energy from wind power, sunlight, solar heat, small hydroelectric power, geothermal heat, biomass, and waste. The targets for the amount of primary energy comprised of “new and renewable energy” are 2.4% (2007), 6.1% (2020), and 11.5% (2030). In 2007 biomass accounted for 6.0% of new and renewable energy, but the country plans to try to expand the use of biomass by raising this to 30.8% for 2030. A feed-in tariff (FIT) scheme is in place for firms that do not receive capital investment subsidies from the government of over 30pc. But the RPS will replace the FIT next year, and Canadian producers have been working hard to secure market share ahead of the change. In wood pellets, Korea has implemented a programme that covers the construction of eight new pellet plants. In addition, with only limited opportunities to generate feedstock from its domestic sawmilling industry, the government has set a goal of importing 5 million tonnes of pellets by 2020. By then, 75-80 percent of pellets consumed in the country are expected to be imported. South Korea’s energy companies have been exploring opportunities to import pellets from Australia, Vietnam, Indonesia, Canada and the US. In July 2012, Korea Electric Power (KEP) set out to become the first to buy wood pellets to meet its renewable energy quota with a tender for 15,000 tonnes. We are a leading exporter of wood pellets in Vietnam. At present we are able to supply a large volume of wood pellets with over 10.000 Mt/Month. Therefore, we are looking for long-term collaboration with foreign buyers, importers or investors in wood pellets. If you are interested in our products, please feel free to drop us a letter to email address: pj@pjimex.com or give us a call via number: +84 909570091 to get best rate quotation. We do hope have a chance to cooperate with worldwide customers. Please refer to our website http://pjimex.com for further information.